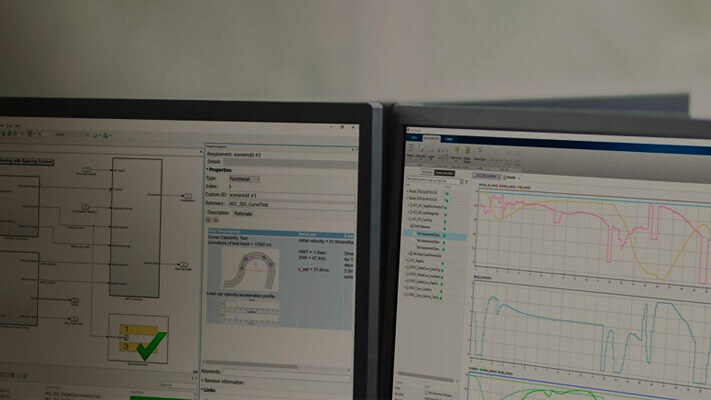 Simulink® Coverage™ measures model coverage and code coverage to indicate untested elements of your design, such as logical conditions, unintended functionality, and switch positions during simulation. Review coverage information for the model in generated reports and in highlighted models to identify missing coverage and navigate to the associated requirements. Determine if you need to modify the requirements, test cases, or design to meet your coverage goals. Validate your model tests by measuring how thoroughly the model objects are tested. Develop effective tests with model coverage. In the Simulink Editor, specify several coverage recording options. Model coverage metrics provided by Simulink Coverage . Create and view cumulative coverage results for a model with a reusable subsystem. Collect cumulative model coverage from successive simulation runs. Create and run test cases by using the model coverage MATLAB® commands cvtest and cvsim. Analyze model coverage for C/C++ S-Functions. Describes the definitions of MCDC coverage used in Simulink Coverage. Describes the difference between MCDC coverage in Simulink Design Verifier™ and in Simulink Coverage. This model includes various patterns of cascaded Logical Operator blocks. This example illustrates how Simulink® Coverage™ records the MCDC metric for a cascade of Logical Operator blocks. Learn how inlined parameters, block reduction, and conditional input branch execution can affect your model coverage data. Model objects that receive model coverage during simulation. Simulink objects that do not receive coverage. Use model coverage for MATLAB Function blocks and interpret the results. Determine the extent to which a model test case exercises simulation control flow paths through a model. Collect model coverage when a model has multiple Model blocks that reference the same model. This example model explains how Model Coverage relates to MATLAB code inside a MATLAB Function Block. This example shows how to configure an S-Function generated with the Legacy Code Tool to be compatible with coverage. Simulate this model to collect and report Saturate on integer overflow coverage. Illustrates the use of the Coverage Results Explorer to simplify the generation of cumulative coverage data and reports spanning a set of multiple coverage runs. Record coverage in multiple parallel Simulink® simulations corresponding to different test cases by using SimulationInput objects and the parsim command. If Parallel Computing Toolbox is installed on your system, the parsim command runs simulations in parallel. Otherwise, the simulations are run in serial. The application of coverage analysis to a simple design problem and compares the coverage requirements for different metrics.